Mint has been on my mind lately. I recently broke out RateTea’s main category of mint tea into separate categories; the main page is still used for blends, but there are now dedicated categories for spearmint and peppermint. This post is about other types of mints that as of yet, don’t have dedicated pages on the site. Mentha arvensis. Photo by Ivar Leidus, Licensed under CC BY-SA 3.0. I grew up growing and brewing up many varieties of mint, so many that I don’t think I could exactly count the number of mints I’ve grown in my garden and brewed up as herbal tea. We would also often blend these mints, usually with each other, and sometimes with black tea. The most common mints we used in herbal tea were spearmint (Mentha spicata) and apple mint or wooly mint (Mentha suaveolens). Less frequently, we would use horse mint (Mentha longifolia), peppermint (Menta x piperita), orange mint (a peppermint cultivar), pennyroyal (Mentha pulegium), and Corsican ground mint (Mentha requienii). We’d also blend these plants with other mint family herbs that have less overtly minty aromas, like the Monarda species (Bee balm, wild bergamot, etc. ), lemon balm, or pineapple sage. Horsemint, Mentha longifolia. This mint is a little like spearmint but more bitter in flavor and earthy in aroma; I find it pleasant for a change of pace. Photo by Franz Xaver, Licensed under CC BY-SA 3.0. As I got older, I found even more varieties of mint both for sale, and growing in people’s gardens. One of the best places to buy fresh herbs that I’ve ever found anywhere in the world is Wing Phat Plaza on Washington Ave. in South Philadelphia. This is a massive Vietnamese/Chinese supermarket, and it has a whole half aisle dedicated to fresh herbs, with many types of mint that I had never seen or smelled before encountering them in this store. Even limiting yourself to the true mints, species of the Mentha genus, there are around 20 species. But the hybrids of these species are very important, and can have unique aromas, distinct from any of the naturally-occurring species; peppermint is the best known, but there are at least 10 hybrids I found documented. And for each species or hybrid, there are numerous cultivars, and the cultivars can also differ radically in their aromas, even within the same species or hybrid. For example, one peppermint cultivar that I grew in my garden in Delaware didn’t smell minty at all, and I used it frequently in cooking as a basil substitute. Mountain mints (Pycnanthemum sp.) are not true mints, but the aroma of many species, like Pycnanthemum muticum shown here, is is decisively minty. This plant is also striking in landscaping, with its pale bracts which persist far longer than any flowers. Photo by SB_Johnny, Licensed under CC BY-SA 3.0. If you want to include other mint-family plants with a minty aroma in genera other than Mentha, there is even more diversity. 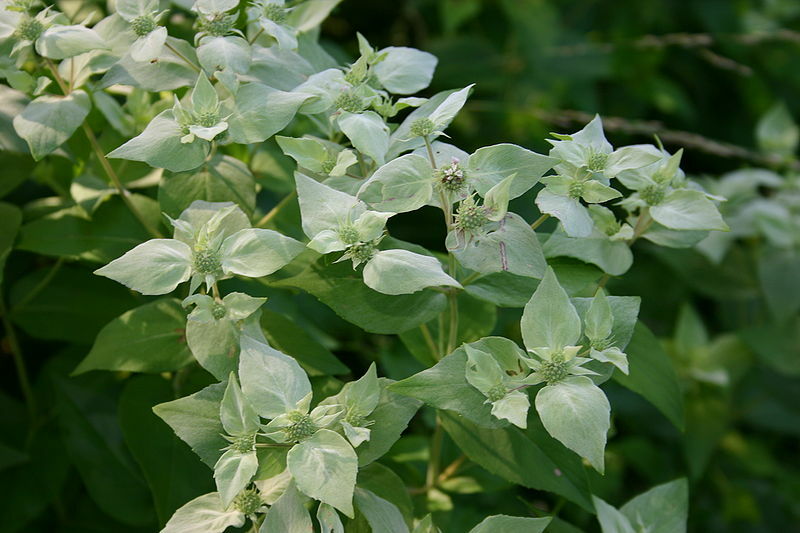 Pennyroyals, with strong minty aromas, include plants of the Hedeoma and Monardella genera, and many of the mountain mints, Pycnanthemum, also smell minty. I recently started growing Pycnanthemum muticum, and I love it; besides the wonderful aroma, it is a very beautiful plant, with unique pale flower bracts that add a nice visual flair to the garden from the time they bloom mid-summer to when the plant dies down in late fall (my plant still looks quite pretty mid-November). I find it odd how, in spite of the incredible diversity of mints out there, nearly all mint commercially available in dried form is either spearmint or peppermint, and usually, one of the “typical” cultivars (I’ve never seen dried orange mint or chocolate mint for sale, in spite of these flavors being popular, and these cultivars being widely available, relatively easy to grow, and preserving their flavor well upon drying). Even Mountain Rose Herbs and Frontier Co-op, two of my favorite herb companies, both of which carry a stunning variety of herbs for sale, some esoteric, only sell peppermint and spearmint. This lack of diversity, however, is not so odd when you consider that it follows a trend that exists in virtually all types of produce. For example, of the thousands of varieties of potato, there are only a handful available in typical stores. According to the International Potato Center, there are over 4000 varieties of potato native to Peru, but if you go to a typical supermarket, you’ll be lucky to find a dozen different varieties of potato, and often stores only have a few. The same pattern plays out with fruits, vegetables, and countless other agricultural products. The answer probably lies more on the supply end than the demand end, in the structure of big agribusiness. The business structure and the farming methods may both contribute. The way a lot of modern agriculture is practiced involves vast monocultures of a single crop, usually a single cultivar or cloned variety of a crop. This setup is far from the natural environment most plants evolved to grow in, and many plants don’t fare well in this sort of growing environment. Although not the case for mint (a relatively pest-free plant even in commercial cultivation), some plants that are relatively pest- and disease-free on a small scale, can succumb readily to pests and disease when it’s grown in a big monoculture. Even when the plant grows well, the qualities that make a plant desirable to grow on a small scale may not lend themselves to commercial harvest. Any gardener in a temperate climate who has grown mint will testify to its aggressiveness and ability to completely take over a garden with little encouragement, but this is usually because it is not being aggressively harvested. Mint’s leaves are nutrient rich, and the plant has high nutrient needs, making it deplete the soil quickly if harvested commercially. It is also shallow-rooted, making it poor for holding soil on a large-scale. Mint: The Genus Mentha, a book describing commercial mint production, describes how mint has high nitrogen needs, and also requires supplemental Potassium, Phosphorus, and Sulfur when grown in plantations. A commercial mint field in Imbler, Oregon; people think of the Pacific Northwest as wet, but much of the mint is grown inland: this region uses irrigation as it is too arid to grow mint with rainfall alone. Photo by Gary Halvorson, Oregon State Archives. Of all the peppermint cultivars in existence, only a few are grown commercially, and there is a big difference in yield between the different cultivars. It could be that there simply aren’t cultivars of the other mints that are commercially viable for large-scale production. But I don’t think the ecological constraints of commercial farming explains everything. Mint is incredibly easy to grow on a small scale, and in order to explain why nothing other than peppermint and spearmint are available, you need to look at the business structures as well, in particular, the big corporations that control production, marketing, and various steps in the supply chain. If you’re selling a product, it can be a lot of work to break into the market when dealing with big box stores and chain retailers. I’ve spoken with people in small and medium-sized businesses about these challenges, not just in the food industry, but when dealing with any sort of large retailer. A rather high level of production with a consistent supply is mandatory, and a high level of consistency is also often demanded, and the consistency can be more important than the average quality. Furthermore, for new products, there needs to be demand for a product, which usually means that the product needs to be so self-explanatory or familiar that it fits into existing demand. For something like a new variety of mint or a new variety of produce, in most cases, the initial demand will be too low to break into the big markets of supermarkets and retail stores. This is particularly true for new and unfamiliar aromas, as people take time to develop a taste for something that smells unfamiliar. This whole model of food distribution doesn’t lend itself to variety. When I shop at small farmer’s markets, I often see a lot more variety. I see vegetables and herbs that I’ve never heard of before, and they often sell well. People buy them out of curiosity. This sort of business structure enables people to explore, discover, and become fond of (and even loyal to) new or unfamiliar varieties of produce. Above I explained the challenges I see for people marketing varieties of mint other than peppermint and spearmint. 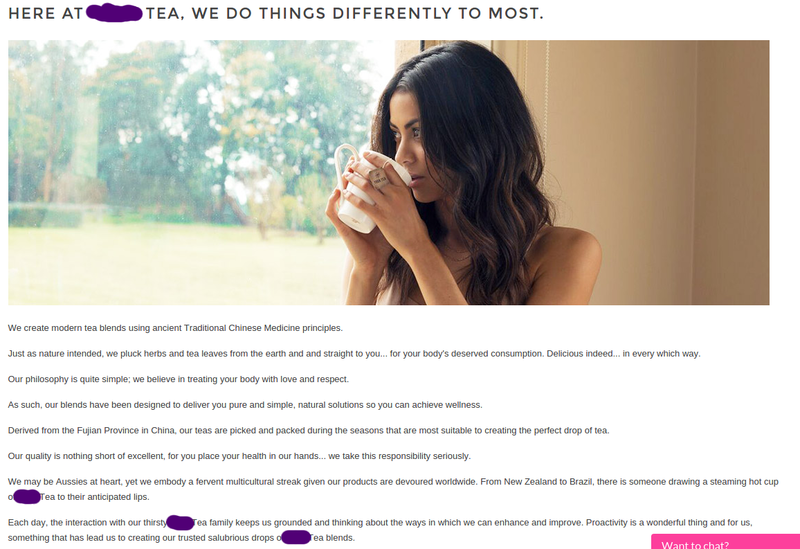 But I think that the tea industry, including herbal teas, is unique. Over the past few years I’ve attended trade shows like World Tea East and the Philadelphia Coffee & Tea Festival, and at these shows as well as through my other work on RateTea, I’ve seen a steady stream of new companies starting up (hundreds of new companies), and I’ve also seen existing companies, both large and small, exploring and marketing new products. The tea industry is already a place where companies successfully market new products with unfamiliar or novel aromas on a regular basis. The novelty or added nuance of a new variety is often a key asset! Furthermore, in the world of tea, plenty of companies are marketing unfamiliar products successfully, sometimes even building their whole business around them. 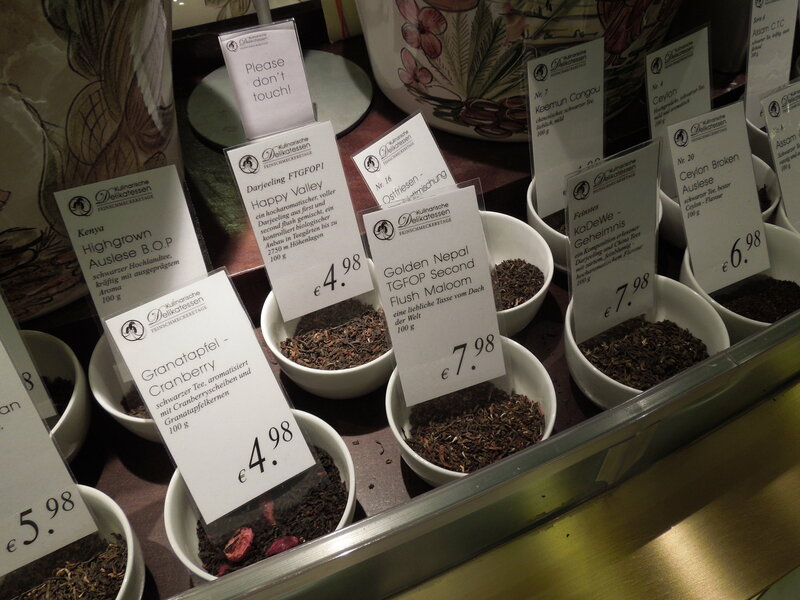 Even in the relatively conventional realm of black teas, like the counter pictured above, the novelty of a new product, a tea with an interesting aromatic note or some unfamiliar flavor twist, is a major asset. With large selections, the cost or risk of experimenting with a new offering is relatively low. But companies are doing far weirder, riskier things than just adding a subtly-different item to their catalogue. The company Runa is now selling Guayusa, and there are even a few companies selling Yaupon, a caffeinated plant native to North America. Just this weekend I found a company selling Mamaki, an herb native to Hawaii, and the company expressed that the product is relatively popular and is selling well. Apple mint or wooly mint – This mint is very similar to spearmint in aroma; it’s exceptionally easy to grow and I could imagine it might even have a higher yield than spearmint, as it grows taller and has larger leaves. There is also the fascinating variety of this species, pineapple mint, which really does resemble pineapple in aroma, although it is trickier to grow. Peppermint cultivars, particularly orange mint (which has a very complex aroma, which I’ve found to be pleasing to connoisseurs of pure black teas) and chocolate mint (which has a more subtle mintiness and really does suggest chocolate in aroma). These cultivars are also less vigorous than the standard varieties of peppermint, but the payoff might be higher as their aromas are both complex and pleasing to many people. Other mints, like the mountain mints, or the two native American mint species, or the various mints popular in Vietnam and other Asian countries. Native American mint species, grown in the U.S., would have the added benefits of being well-adapted to the climate here, as well as appealing to people committed to sustainability by favoring a native species. Blends of different mint species, either on their own, or blended with other herbs. 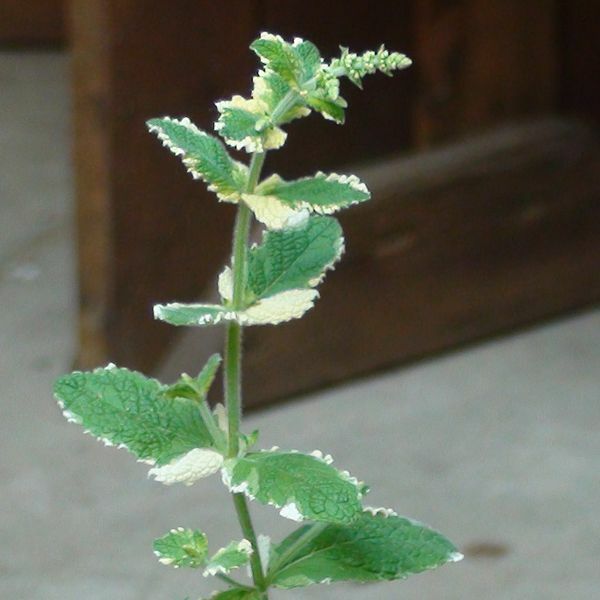 Pineapple mint, a cultivar of apple mint or wooly mint (Mentha suaveolens). Photo by Johann D. Kuntz, Licensed under CC BY 3.0. Do you use mints, either as culinary herbs, or in herbal teas or blends? Have you tried any mint varieties other than peppermint or spearmint? What are your favorites? Do you agree that the mint varieties other than peppermint or spearmint represent an untapped business opportunity? Categories: Original Posts | Tags: agribusiness, agriculture, biodiversity, gardening, herbal tea, herbs, mint, mint tea, tea | Permalink. As a side note, the East India Company has relaunched, but that’s a whole other topic; an Indian, Sanjiv Mehta, bought the rights to the name in 2005 and relaunched it, describing feeling a “huge sense of redemption” in buying the rights to the name. The tea in question is called Oriental Treasure Green Tea, and is sold by Bentley Tea, a brand of the Boston Tea Company. In an ironic twist, this company has roots in opposition to British Imperialism and the East India Company. The Boston Tea Company was founded by people who salvaged crates of tea that had been thrown overboard in the Boston Tea Party. I had a similar reaction as Mariko to the tea’s name. I tend to react pretty negatively to things labelled with terms like “oriental treasure”. I have come to associate the term “oriental” with the sort of patronizing attitude that Western society took towards eastern societies (very broadly, anything from the Middle east through east Asia, sometimes even including North Africa) for quite some time, often described nowadays as Orientalism. A key book in this movement is Edward W. Said’s Orientalism (1979). This book, which is somewhat controversial, argues that much of the scholarship on the regions described as “the East”, is tied to Western imperialism, and is based on a false view of these cultures and people as inferior. I think it would be good for marketing language to avoid evoking associations of imperialism, racism, and a condescending attitude towards Eastern cultures. I don’t think everyone necessarily has these same associations though. Our world is incredibly vast and diverse, and I am continuously reminding myself that not everyone has come into contact with the same circles as I do, nor will they necessarily be aware of the same sorts of social issues that people in my circles tend to be aware of. I see the term “Oriental” in business and marketing a lot less now than when I was a kid some 25ish years ago, but I still do see it, including being used by Asian companies and Asian-American owned businesses here in the U.S. And I hear the term used occasionally by older Americans. 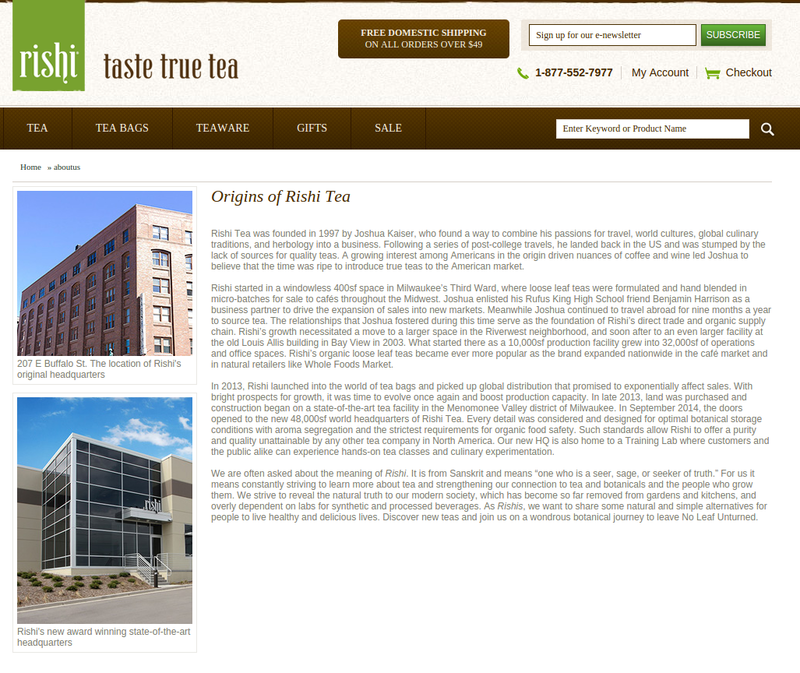 A number of tea companies still use the term “Oriental”. The most common reference is in the style of oolong, oriental beauty, although I’ve seen the Chinese name “Bai Hao” used more for this tea in circles of tea connoisseurs and companies catering to a more knowledgeable customer base. Outside bai hao oolong, the term “oriental” is uncommon in the tea world. A RateTea search turned up only a handful of teas other than that oolong which contained the word “oriental”. Incidentally, many of them are sold by Asian companies. Oriental beauty Oolong tea, from Life in Teacup, also frequently described by the Chinese name “Bai Hao”. I do think though that the negative associations with the term have been increasing, and I think there are valid reasons behind the concern that there is a certain latent racism, imperialism, or other negative sorts of cultural biases underlying the term. For this reason, I think it would be a good idea for marketing professionals within tea companies and working with tea companies, to be conscious of these issues, and probably to avoid this term. Alienating even a small segment of customers through your choice of tea names is not a great marketing strategy, and it’s likely that this segment will only increase over time. The potential range of choices for a tea name is almost boundless, and I think it’s easy to come up with names that are both more descriptive, and evoke more universally positive connotations. Are you familiar with the concept of Orientalism as described here, or is it a new concept for you? How did you react to the name of the tea in question here? Do you react negatively to the term “Oriental” in general? Do you find it ironic that a company that grew out of a reaction against British imperialism is now using terminology that has come to be associated with such imperialism? Categories: Original Posts | Tags: Boston Tea Company, Boston Tea Party, East India Company, imperialism, marketing, orientalism, tea | Permalink. For a preview, this post will be featuring rooibos, red raspberry leaf, and New Jersey tea. There is a significant demand for decaffeinated tea. 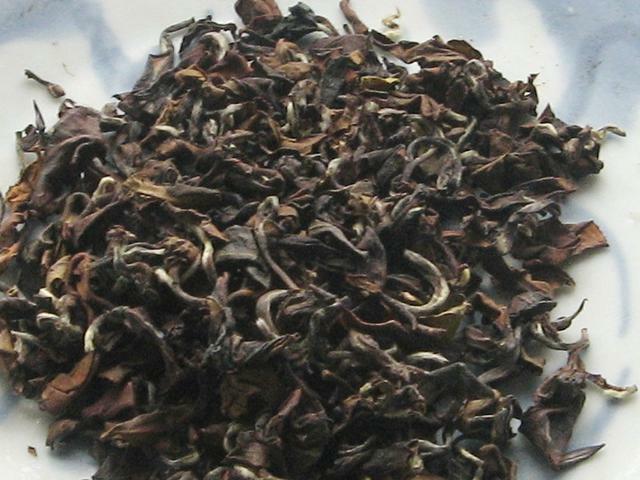 RateTea currently lists 231 decaf teas, around 3.5% of the 6600+ teas in the database. (This figure only includes true teas that have been decaffeinated–not herbal teas that are naturally caffeine free.) And Google Trends shows that the search interest in decaf tea is on the rise, with a spike that coincides with the interest in green tea, which I wrote about on SpontaneiTea recently. Decaffeinated flavored or spiced teas, like this “chai spice tea” sold by Stash, often taste better than pure decaf teas, because the additional flavorings can be added after the decaffeination process removes much of the flavor from the tea. Photo by JHoltzman, licensed under CC BY-SA 3.0. On a personal level, I understand and relate to the desire for drinking decaf, at least in the abstract. I love tea, and I frequently drink enough of it that I don’t want any more, not because I tire of the taste or experience of drinking it, but rather, because I can only handle so much caffeine. Different people have different sensitivities to caffeine, and I find that I tend to be pretty sensitive to it. Tea festivals and trade shows like World Tea East or the Philadelphia Coffee and Tea Festival often put me in a bind–I want to keep sampling teas, but because I get so caffeinated, I turn down all but those I feel pretty sure I’ll like, and I’ve learned to pace myself with respect to the caffeine. So I understand how someone could want to drink tea without caffeine. But decaf tea never satisfies me. In fact, more often than not, I think it tastes quite terrible, and I’d rather drink nothing or water than drink it. I’ve poured out many a decaf tea, brewing it only to find that it doesn’t even taste drinkable to me. Even the best decaf teas, to me, are ones that I dislike less rather than ones I truly love. Yet there is no shortage of naturally caffeine-free herbal teas that I enjoy. There are also other reasons to avoid drinking decaf tea. One is health, and another is resource usage, which is related to sustainability. In this post, I will explore some of the reasons to drink naturally caffeine-free herbs rather than decaf tea, and I will give examples of the herbs that I think make the best tea substitutes. Decaffeination processes for coffee and tea have come a long way in terms of health and safety. Can you believe that benzene used to be used in decaffeination (for coffee, not tea)? Benzene is a major carcinogen and one of the most dangerous chemicals out there, in large part because it is both highly volatile and odorless. One of my relatives, a non-smoker, was an artist and used benzene as a paint thinner, and died of lung cancer. Thankfully, our society woke up to the dangers of this chemical long ago, and it has not been in use in decaffeination for years. If you want to learn more in-depth about the decaffeination processes, both current and historic, used to remove the caffeine from tea, I recommend reading RateTea’s article on decaffeinated tea. Although there are a few esoteric processes, most tea nowadays is decaffeinated by one of three processes: CO2 (Carbon Dioxide), ethyl acetate, and methylene chloride. I seriously doubt that decaf tea is going to kill or seriously harm anyone, but there have been some health and safety concerns associated with methylene chloride. The other two processes, from my research, are totally safe. Ethyl acetate sounds like a synthetic chemical, but it is a naturally occurring chemical, one that even occurs in tea leaf itself and may be an important (and pleasant) component of the fruity aroma of both tea and wine. Methylene chloride or dichloromethane, a probable carcinogen and known liver toxin, is used in some decaffeination processes. Methylene chloride, synonym dichloromethane, on the other hand, is a toxic chemical that shows some evidence of carcinogenicity. The use of this chemical is still legal in the United States. The EPA’s fact sheet on the chemical claims that the chemical does not harm the Ozone layer (unlike the fluorocarbons), but it can cause serious health problems, even at concentrations as low as 100 parts-per-million. Ingesting the chemical in a high enough dosage can cause liver problems, and the compound is classified as a probable carcinogen in humans, on the basis of it being a known carcinogen in animals. Although the use of methylene chloride in decaffeination is regulated, I’m not convinced that it is always used within safe limits. I located one study which measured 15.9 parts-per-million of this chemical in a sample of commercially available decaffeinated tea. This is far higher than the allowable limit, and an amount that is enough to raise concerns about chronic/subchronic toxicity of the liver and possible carcinogenicity, especially in people who drink decaf tea regularly and in volume. For this reason, I recommend for tea drinkers to avoid decaf tea where the decaffeination process is not identified as CO2, ethyl acetate, or another safe process. I also recommend for tea companies to phase out using methylene chloride, and for companies using safer processes to clearly identify which decaffeination process they do use, so that tea drinkers don’t overzealously avoid their products thinking they may be using the old methylene chloride process. As an example, Upton Tea Imports sells both CO2 and ethyl acetate decaf teas, and clearly identifies the process used on each tea. From a resource usage standpoint, decaffeinated tea is extremely inefficient. Tea has been cultivated in large part because of its caffeine content, and many cultivars have been selected, in addition to their flavor, for their moderate-to-high caffeine content. A lot of effort goes into tea production; decaffeination effectively throws out a large portion of that effort. Photo by Martin Benjamin, licensed under CC BY-SA 3.0. When tea is decaffeinated, regardless of which process is used, both flavor and caffeine are extracted, not to mention the polyphenols that function as the antioxidants in tea and are responsible for some of tea’s health benefits. Furthermore, the decaffeination process is itself costly and energy-intensive. The CO2 process, generally considered the most desirable of the three processes mentioned above in terms of both safety and preservation of flavor, is particularly costly as it involves the use of supercritical carbon dioxide (i.e. compressed under great pressure). This is because, at regular atmospheric pressure, carbon dioxide transitions directly from a solid (dry ice) to a gas, without going through a liquid phase. 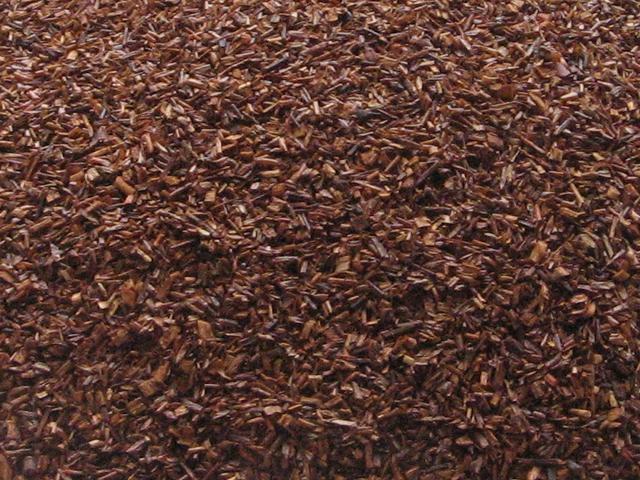 Rooibos is the herb that I see most frequently presented as being “tea-like”. It certainly is nowhere near as diverse as black tea, but it does share some characteristics, both of production and flavor and overall character, with black tea. Rooibos is one of the few herbal teas that is naturally oxidized, in a process analogous to how black tea is oxidized during production. Rooibos, or South African “Red Tea”, is one of the herbal teas said to more closely emulate black tea. I find that rooibos replicates the body, mouthfeel, and overall sensations on the palate of black tea more so than it emulates tea in aroma. There are certain earthy characteristics of aroma that rooibos shares in common with some black teas, but overall I find its aroma to be distinct. I find its aroma sometimes suggests vanilla, and while it has a fruitiness to it, the fruitiness seems more to suggest strawberry, in contrast to the grape, raisin, or stone fruit aromas suggested by some black teas. Perhaps more importantly to me, rooibos completely lacks the malty and floral tones that I like in a lot of black teas, and I find that its flavor profile tends to be muted–making it similar to some of the more muted black teas, but never like a strong Irish Breakfast or Assam, or even a sharper Darjeeling. Red raspberry leaf is best-known as a women’s health product. Yogi Tea sells tea bags of this herb with the caption “Supports the female system“, a blurb I find amusing as I like to drink it as a beverage, and I certainly enjoy a strong female support system in my life. Medicinally, red raspberry leaf is typically consumed most during pregnancy, on the grounds that it supposedly strengthens or tones the uterus. However, several of my friends also swear by its effectiveness for PMS and menstrual cramps. As this is one area where I have no personal experience, and I was unable to find any studies backing up this use, the best I can give you is anecdotal evidence. Leaves of the red raspberry plant, Rubus idaeus, can be used to make a caffeine-free herbal tea which in some respects resembles black tea. Public domain photo by Matti Virtala. Unlike some women’s health teas (like lavender or honeybush), red raspberry leaf does not seem to alter hormone levels, and it is thus safe for both men and women to drink as a beverage. And drinking it as a beverage is something I not only do, but recommend, especially for people who want something that tastes like black tea–as I find this herb tastes a lot like black tea. For starters, the color of the brewed cup is much more like a typical black tea, a rich brown color, than rooibos. Where the similarity really shows up, however, is in the aroma. It certainly doesn’t smell exactly like black tea, but I find that red raspberry leaf tea has an aroma that captures some of the floral tones in high-grade black teas. The tannins also seem to resemble black tea more than rooibos does. I would say raspberry leaf is probably most similar to a Ceylon, and possibly even some Darjeeling teas. The sensation on the palate, and mouthfeel though of this tea, is very different, I would say much less tea-like than rooibos. I find that it has a thinner body with a clearer feeling…and while there is an astringency that slightly resembles some of the more tannic teas, the astringency hits in a different way, I find coming more in the aftertaste and being a little less up-front than, say, in a strong breakfast tea or Assam. One herb that I’ve read about extensively, and have been itching to try, but have yet to actually get my hands on, is New Jersey Tea. New Jersey Tea, or Ceanothus americanus, is a plant in the buckthorn (Rhamnaceae) family. This plant family is distantly related to the rose family, and besides the namesake Buckthorns (small trees and shrubs), contains very few plants familiar to most residents of North America or Western Europe, although residents of the Western U.S. may be familiar with the snowbrush ceanothus, Ceanothus velutinus. Both the snowbrush ceanothus and New Jersey Tea were used by native Americans in herbal infusions to treat upper respiratory infections like the common cold and influenza. New Jersey Tea, Ceanothus americanus, in bloom. Public domain photo courtesy of the United States Fish and Wildlife Service, Sherburne National Wildlife Refuge. I’ve also read that New Jersey Tea plant shares some aromatic components with wintergreen oil, and wintergreen tones are one of my favorite aromatic characteristics of high-quality black tea–and a quality that is captured in neither rooibos nor raspberry leaf. I have a feeling that I may really like this one when I finally try it. Often, when I drink herbal tea, I don’t insist that my beverage resembles tea at all. Most of my favorite herbal teas taste nothing like black tea or any pure tea for that matter. Some of my favorite herbs to brew herbal teas with include spearmint, orange mint, tulsi, lemon balm, pineapple sage, and lemon verbena, to name a few. I also love the Monarda species, some of which resemble the bergamot flavoring in Earl Grey (without resembling the base black tea as much). I’d take any of these herb teas over a decaf black tea any day. Sometimes I find that enjoying herbal teas on their own is more satisfying than trying to seek out ones that taste like black tea: although it’s possible to get close, it’ll never be possible to get an exact match, and I feel like herbal teas are easy to enjoy as a phenomenon in their own right. Do you ever feel the desire or need to avoid or limit your use of caffeine? Does the idea of a decaffeinated or caffeine-free tea-like beverage appeal to you? Have you ever found a decaffeinated pure tea that you really loved? I’m not talking flavored teas like Earl Grey, as the flavors can be added in after the decaffeination is carried out; I mean a straight tea like pure black tea. Are you concerned about the potential health issues surrounding the use of methylene chloride? Were you aware that this chemical is still in use in decaffeination processes? Have you tried any of the three examples I gave of naturally caffeine-free beverages that resemble black tea? Can you think of any herbal teas that I’ve missed, that you think would make a good addition to this list? When drinking herbal tea, do you seek out something tea-like, or are you more likely to go for something completely different? Categories: Original Posts | Tags: black tea, caffeine, decaf, herbal tea, new jersey tea, raspberry leaf, rooibos, tea | Permalink. This post will take you through two opposing aspects of food culture in the United States, and explain how I think tea fits more into one side that the other. It also explains my desire and intention to use RateTea as a platform for shaping the tastes of Americans in the direction of one of these types of food culture and away from the other. There is a degree to which the United States is viewed by the international community as a desert of food culture. When dining at a Vietnamese restaurant with my friend Brent the other day, he remarked that most of what he thinks of as American food is either bland, or hits you in the face with strong flavors, like very sweet or very sour. I’ve heard a lot of my friends and relatives complain about the food culture in America, but I think it’s more telling how people from other cultures perceive the U.S.
Fast food. Burgers. French fries. Soft drinks. McDonald’s. A McDonald’s in Casablanca, Morocco. With such a global presence, it is no wonder that McDonalds is what many people around the world think of when they think of food culture in the United States. Photo by Soman, Licensed under CC BY-SA 2.5. On some level, I’m really saddened by this impression. I think of this particular type of fast food as one of the worst aspects of American culture–one of the least healthy (with its huge portions of factory-farmed meat and refined carbs), one of the least sustainable, and one of the most devoid of culture. Rather than being formed from a rich and continually evolving culinary tradition perfected and passed down through generations, American fast food is something that I see as originating in corporations and being motivated primarily by profit rather than holistic health and culinary mastery. American fast food is a recent phenomenon, less than 100 years old. The corporate machinery of the fast food restaurants can spin out of control, overpowering the original culinary traditions behind the restaurants. As an example of this, I read that the famous fast food icon Colonel Sanders, who originally founded KFC, later sued KFC for using his image on products that he did not approve of because he considered them poor quality. This type of food culture though is unfortunately not limited to fast food, nor is the corporatization of food or the industrialization of the food supply. There are many subcultures within America where something similar to fast food really is what people see as “food”. I often encounter such food at church events, like outdoor BBQ’s or other events…white bread buns, hot dogs and hamburgers taken out of packages, iceberg lettuce, and the like. To me, it’s a food desert. If it’s bad enough, I sometimes even choose to go hungry and eat before or after such events. It is bad enough that it has sometimes been a wedge that has divided me from communities that I would otherwise want to participate in, like a church where I enjoyed the community and found meaning in the spiritual message. Iceberg lettuce, pictured on the left, is an example of the impacts of an industrialized food supply. According to the University of Illinois Extension, Iceberg lettuce is the most widely-consumed lettuce in the U.S., but its popularity is due primarily to the fact that it ships well: it is mostly water and is much lower in nutrients than other lettuces, shown on the right. Where does tea fit into this picture? It doesn’t have much of a place here. Tea is a subtle beverage. It’s primarily aromatic, it doesn’t offer the same caffeine kick that coffee does, and the flavor, even of bold teas, is subdued compared to coffee (or soft drinks). Culturally, tea is associated with slowing down, taking a reflective break, more than speeding up or ordering food on the run. And artisan tea, the sort that I love to drink, and am looking to promote through my work on RateTea, has even less of a place in this culture. In short, I think tea, especially the sort of tea I am most passionate about, is more about slow food than fast food. If you found the section above a bit depressing, don’t despair: the food and drink culture in the United States is much more diverse than the first impression of the international students above suggests. The U.S. is a hotspot of ethnic diversity, and with that diversity comes a richness in culinary traditions. Virtually everywhere I have ever lived in the U.S., even in smaller towns, I’ve found numerous ethnic restaurants. I once drove across the country myself, and have taken numerous other road trips, and I’ve often been surprised at where I encounter little ethnic enclaves, often accompanied by restaurants that I end up giving 5 stars on Yelp. Bibimbap, a mainstay of Korean cuisine, is now one of my favorite foods; I had never tried this dish, or any Korean food, until I was 25. This dish is typically served in Korean restaurants with barley tea (mugicha/boricha). Mexican and Chinese food are available virtually everywhere in the U.S., and while they aren’t always “authentic”, they sometimes can be. When I’ve lived in larger metro areas, I’ve been surprised at the level of diversity I encountered. Many of these types of foods were initially a bit alien to me; Korean food, pictured above, is a good example. The first time I ate it, it was a bit intimidating. I needed to develop a taste for it, but I have come to really love it, to the point where I often actively crave Korean dishes, and even keep a jar of kimchi in my fridge. I’ve eaten at Ethiopian and Eritrean restaurants–multiple of each–and Vietnamese, Cambodian, Malaysian, Japanese, and Korean restaurants. Indian Restaurants. Afghan, Lebanese, Israeli, Moroccan restaurants. In Chinese cuisine, I’ve eaten at restaurants specializing in Sichuan, Cantonese, Yunnan, Taiwanese, and Liaoning regional cuisine. I’ve eaten at restaurants specializing in New Mexican food, Guadalajara-style food, and food from South Mexico, as well as California-style Mexican food, which is its own unique fusion tradition. I’ve had many forms of Latino food, from Puerto Rican to Columbian, Ecuadorian, and Peruvian. I’m sure I’m forgetting quite a few ethnic cuisines in this list. Dry pot, and seafood tofu soup, at a Sichuan restaurant in West Philly. Of course it is served with tea, visible on the left; jasmine tea or oolong are typical types of tea served with this sort of meal. Note that already I’ve already mentioned some regional cuisines peculiar to and originating in the U.S., in the different variants of Mexican food that occur on the U.S. side of the border. The U.S. also is the origin of Cajun cooking, and southern cooking or “soul food”, which incorporates elements from West African traditions–as I realized when I first ate proper West African food and tasted many of the same spices, ingredients, and methods of food preparation. What is the difference between these rich, complex traditions, and the more uniform fast food traditions that the foreign students mentally identified as the food culture of the United States? I think the distinction here is subtle and hard to pin down, but I think it has to do both with the traditions of preparing the food, and with how fast the people are eating the food, and whether or not they are paying attention to how the food tastes. I found that many of these foods were initially a little strange to me, and in different ways. The Sichuan dry pot, pictured above, was so intensely spicy and pain-inducing that I could barely eat it the first time I tried it. Yet I found myself craving it and now it’s my favorite item on the menu at the restaurant where I first ordered it. What made it so enjoyable though wasn’t the volume of hot pepper–it was the nuance…a little flavor of anise here, the cilantro leaf on top, and the wonderful aromatic quality of the Sichuan peppercorn (before it numbs your mouth!) are what keep me coming back to that dish. I don’t expect everyone to like the particular dishes or types of cuisine that I like best, but I notice that if people start paying attention to their food, they naturally gravitate more towards “slow food”. And with this change in focus, I think comes an increase in health and well-being, as well as a great improvement in the joy and pleasure that comes with both eating and preparing food. A couple of my friends have recently read the book Health at Every Size, and that book provides a compelling argument that a more mindful approach to eating has compelling benefits to health. There was also a fascinating study of attitudes towards food in different countries, and their implications for health and dieting; this study examines what it calls the “French paradox”, that Americans think more about the health impacts of their food yet end up eating a less healthy diet, whereas French people think about health less, and focus on enjoying their food, and end up eating a much healthier diet. These observations have led me to believe that a shift away from generic fast food culture and towards a richer food culture could have sweeping benefits for society. I think there is a degree to which tea, especially if you drink it unsweetened, forces you to develop a level of nuance in appreciation of food and drink that naturally nudges people in the direction of slow food and traditional food cultures. Most tea doesn’t hit you in the face with the strong flavors that my friend Brent referenced. Some of my other friends have jokingly remarked that tea is little more than “flavored water”. In some sense, I agree. In order to really appreciate tea, you need to seek out its flavors a bit, paying attention to what you are sensing as you are drinking it. The dominant flavor sensation when drinking tea is usually bitterness, a flavor that has little role in the generic “American palate” referenced at the beginning of this post, the one that demands strong sweet, sour, or salty flavors. Even in the sweetest or sourest teas, or the teas with the greatest savory or umami flavor, these other flavors are subdued, and easy to overlook if you are used to drinking something like soft drinks or even black coffee. Loose-leaf Bi Luo Chun from TeaVivre; when describing this tea as “sweet” or “tangy”, I am describing very subtle flavors that, compared with something like fruit juice, could easily be overlooked. Another key aspect of tea is that its aroma is more interesting than its flavor. Flavor is itself pretty limited–the human taste buds are only able to identify sweet, bitter, sour, salty, and savory (umami) flavors. It is the aroma that makes food and drink truly come alive, and develop into complex culinary traditions. I think that tea has the potential to nudge people in the direction of a more nuanced slow food culture in part by getting people to focus on aroma. When people focus on aroma, it opens up the door to using herbs and spices, as well as the many vegetables that have subtle flavors but interesting aromas. One of my goals and hopes with RateTea is to encourage people to start paying attention to how their tea tastes and smells. My goal is that by writing about the flavor and aromas of tea, and by reading what others write, it will change how people think about and experience food and drink in general, and that this will push them more in the direction of slow food. As much as I wish I could tell a personal story about how tea opened me up to experiencing food and drink in a more nuanced way, I think it was actually beer, more than tea, that did this for me, although tea certainly played an important role alongside beer. 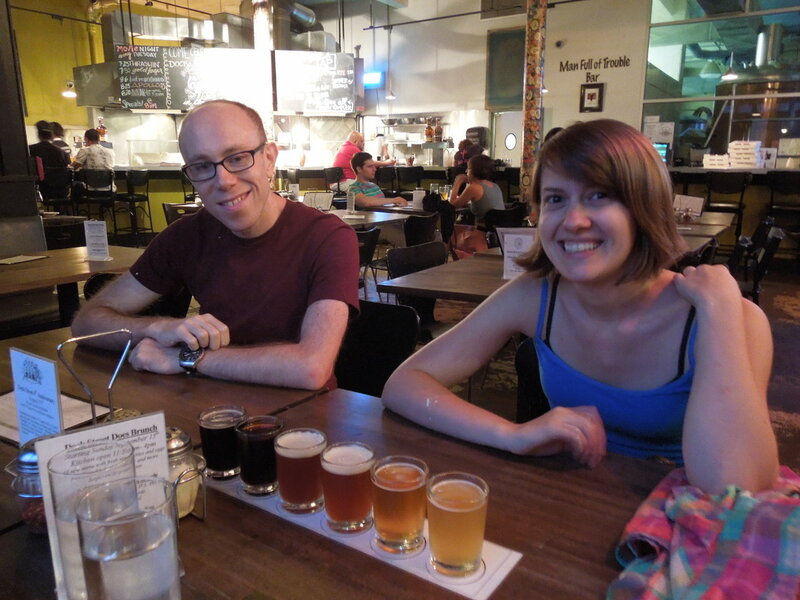 My girlfriend Kelsey, and one of our friends, sampling beer at Dock Street Brewery in Philadelphia. Incidentally, these people are both reviewers on RateTea, and, like me, both enjoy sampling beer as well as tea. I remember sampling beer as a kid; my parents would pour me a tiny little glass, or let me sip it, telling me: “This is beer. It tastes bitter, so you probably won’t like it at first, but if you keep trying it, you’ll develop a taste for it.” And develop a taste I did. By the time I graduated college, I loved beer, and began seeking out craft-brews. I fell in love with Great Lakes Brewing Company in Cleveland, Ohio. I began rating beers on RateBeer, to keep track of which ones I liked. I think beer is actually very similar to tea in its potential to nudge people in the direction of nuance. As with tea, the dominant flavor in most beer is bitterness, and the other flavors are more subdued. And, just with tea, the aroma plays a key role in distinguishing between the finer nuances of different beers. Just like pure teas are able to produce an astonishing variety of aromas, qualities suggesting cocoa, or wintergreen, citrus, mint, malt, orchid, apricot, and all sorts of other aromas, pure beers, brewed with only barley, yeast, water, and hops, are able to produce all sorts of fascinating aromas, resembling various fruits, grassy or herbaceous characteristics, nutty and caramel tones, and many other qualities. I think that it was the process of rating and reviewing beers, actually writing things about what I was drinking, that took me to the next level in terms of perception of food and drink. I think in the long-run, tea may have an even greater potential than beer to catalyze the sort of cultural transformation in perception of food and drink that I outlined above, for several reasons. One is that tea tends to be consumed more often throughout the day, and in different contexts, than beer. I.e. people generally only consume beer in the evening, whereas they often consume tea several times throughout the day. The alcohol in beer makes it less appropriate as a beverage for a broad range of situations. Another issue is that there is a degree to which the alcohol in beer seems to have an effect that is at odds with the finer nuances of appreciating food and drink: while one can easily appreciate the first or second beer in a more nuanced way, after that it begins to go downhill. I’ve heard serious beer connoisseurs remark on this phenomenon–and how they often like to sample the most nuanced beers first in an evening for this reason. Yet another reason is that people see much more likely to drink tea than beer when in a reflective mood, such as when taking notes in a journal, or taking a break from work, as well as sipping tea while at a desk or computer, and both of these situations lend themselves more to the sort of exploration of nuances than the contexts (sitting at a bar with friends, or in a more party type atmosphere) in which people most often enjoy beer. The caffeine and other psychoactive chemicals in tea, like theanine, also seem to lend themselves to a state of mind which favor focus, reflection, and awareness. And the culture of tea also is tied to mindfulness and reflection. Do you think my analysis of the two opposing facets of American food culture is accurate? Is the idea of “slow food” something you think about much? 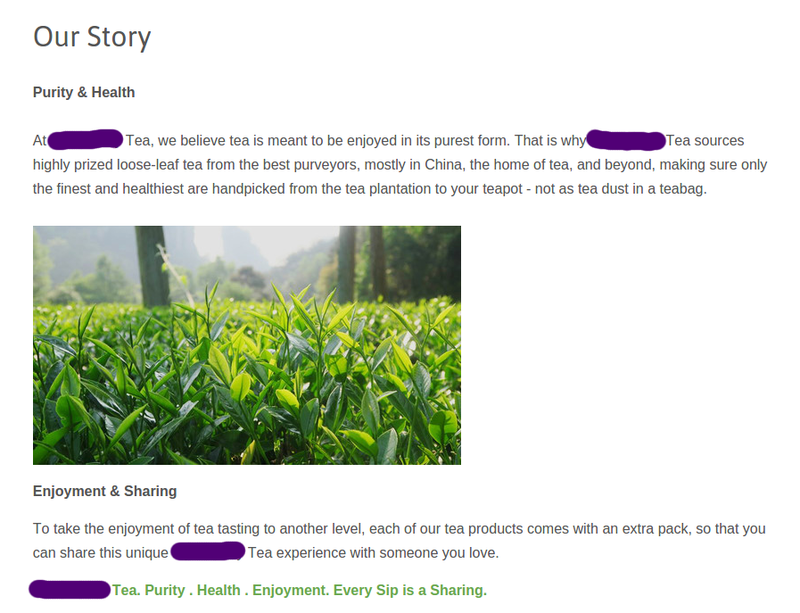 Do you think RateTea will be able to nudge casual tea drinkers in the direction of paying more attention to their food and drink, much in the same way I experienced such a shift in my perception as I started using RateBeer? Do you think that, in the long-run, tea has greater potential than beer to catalyze a cultural shift in the direction of paying more attention to the finer nuances of food and drink? Categories: Original Posts | Tags: beer, fast food, food, food culture, health, slow food, sustainability, tea, United States | Permalink. This post is loosely inspired by my original post: Sustainability: Why Is It Important For Tea? Sustainability is an idea that captures whether something can be continued indefinitely, without adverse consequences or depleted resource forcing you to stop what you’re doing. Using up a non-renewable resource is obviously unsustainable, but there are many other reasons that can cause something to be unsustainable–basically, any practical constraint that forces you to stop. Sustainability is a working concept–it’s about what you can keep doing. Something is unsustainable if you can’t keep doing it. Sustainability is a simple idea, easy for children to understand. I remember thinking about sustainability as a kid, long before I had a name to attach to the concept. As a very young kid, I naturally encountered limits. I would regularly play with wooden blocks, and I learned that there’s only so high you can stack individual blocks before they become unstable and fall over. Stacking blocks on top of each other is unsustainable. The higher you want to stack them, the broader a base of supporting blocks you need. Because there’s a limited supply of blocks, there’s a limit on how high you can build. It’s such a simple idea, but it’s at the heart of deep ecological concepts, like how a food web is structured, or the idea of the carrying capacity of an ecosystem. Wooden blocks a lot like the ones I played with as a child. Photo by Belinda Hankins Miller, Licensed under CC BY 2.0. Another idea I remember thinking about as a kid, that got me thinking about sustainability, was the idea of cemeteries. I saw a lot of cemeteries as a kid, and I noticed that people seemed to view them with reverence, leaving them as-is and protecting them from development even as everything around them changed. Somewhere along the line, I asked the question: since people keep dying, wouldn’t cemeteries eventually fill up and wouldn’t we run out of space to bury people in? My parents explained to me that they do, and that cremation represents an alternative to being buried and taking up space in a cemetery. The cultural practice of burial in cemeteries is unsustainable. One of my photos of Woodland Cemetery in Philadelphia. Cemeteries have gotten me thinking about sustainability in multiple ways: first as a kid, and later, as I conducted a bird survey of this cemetery, for eBird. To show you how complex sustainability can get, even though the idea of a cemetery with burial of people is inherently unsustainable, the cemetery pictured above is promoting a different sort of sustainability–as an island of greenspace in a highly developed urban area, it provides valuable habitat for birds. As a volunteer surveyer for eBird, I gathered a year’s worth of data on this site, surveying it weekly (gathering several data points for most weeks), allowing eBird to produce graphs of what species can be found at this site year-round. 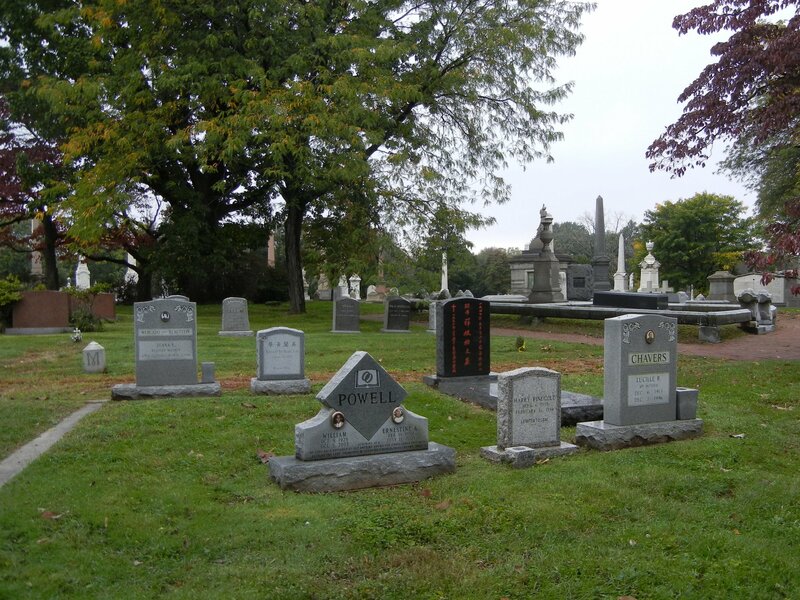 The results are exciting; I and a few other birders have currently recorded 109 species of birds found in this cemetery. View the data for yourself. The lesson that I take from this is that the world is complex, and even if something is unsustainable for one reason, it might provide some other benefit which might promote a different sort of sustainability. In this case, the space used up for a cemetery created a protected greenspace, effectively immune from urban development, that ended up providing greater ecological value for birds than the surrounding urban area. As I explained above, sustainability is a very simple concept, one that I think even young children can grasp with ease. But it can be very complex to implement. Part of the reason for this is the fact that humans depend on their environment for food, clean air and water, and other products and ecosystem services. Environmentalism, on the other hand, is a little trickier to grasp; look at how there’s a lack of a clear definition in Wikipedia’s article on environmentalism. What exactly is “the environment” anyway? And how do you preserve and protect it? I think that in order to grasp what environmentalism is in a meaningful way, one needs a certain degree of scientific and/or cultural knowledge…central concepts in environmentalism are ecosystems, biodiversity, and cycles of water, air, and energy. Each of these concepts takes a certain degree of knowledge and intellectual sophistication to even partially understand. There are a lot of examples of humans misunderstanding how to protect natural ecosystems; for example, for many years we suppressed forest fires in much of North America, thinking it was protecting the forests; now we know that fires are a natural part of the cycle of life for many wild ecosystems, and that fire suppression can cause great damage in the long-run, sometimes culminating in catastrophic wildfires of unprecedented scale. 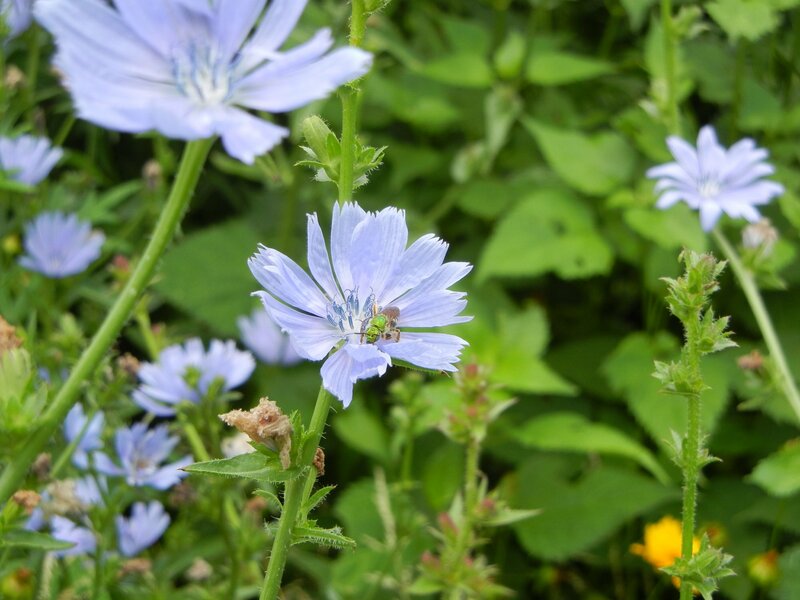 Knowing how to protect the environment can be subtle; here, an introduced species, Chickory, is supporting a native insect pollinator of the Agapostemon genus. I took this photo inside Woodland Cemetery, not far from the other picture above. Sustainability encompasses environmental issues, because humans depend on the environment, so if a practice damages or destroys aspects of the environment that we depend on, it’s not sustainable. But this is only one part of sustainability. Practices can be unsustainable for human reasons, such as if a particular policy or practice causes political unrest or social upheaval. So the two concepts, while they are closely related, are definitely distinct and to some degree independent of each other. Does this have anything to do with tea? I think the answer to this question is: “Yes and No.” So far, I haven’t talked about tea at all. This is because my reasons for believing in and living by the idea of sustainability have nothing to do with tea. If tea did not exist, I would be just as committed to sustainability as I am now. But at the same time, sustainability has everything to do with tea; the way I see it, sustainability has everything to do with anything that involves human choices…it’s a fundamental, common sense idea that informs every aspect of my life, so of course I want to apply it to tea. How does sustainability manifest in my thinking about tea? Is sustainability also a driving value in your life? How do you think about sustainability as it pertains to the world of tea? Are there any major ideas that you think I missed in my list above? How did you come to embrace the idea of sustainability? Was it common-sense to you, and was sustainability merely a word that you assigned to a concept you already understood and were committed to? What life experiences or ideas led you to understand the importance of this concept? Do you make a distinction between environmentalism and sustainability? Can you think of examples of aspects of sustainability that have less to do with environmentalism? Can you think of any aspects of environmentalist movements that are perhaps unsustainable or divorced from the idea of sustainability? Categories: Republished Posts | Tags: cemetaries, children, ecology, environmentalism, ideas, limits, sustainability, tea, values | Permalink. This post is an expanded, follow-up post to my original post Energy Saving Tips for Making Iced Tea. I also expounded these same ideas in RateTea’s article on iced tea. The hottest part of summer is approaching, and I’ve already brewed up my several first batches of iced tea. As subscribers to my old blog and readers of the articles on RateTea will likely know, I’m a die-hard advocate of brewing your own iced tea, ideally from loose-leaf, rather than purchasing pre-brewed bottled or “ready to drink” teas. But here I’m going to take for granted that people are interested in making their own iced tea at home, and I’m going to focus on how to do so in a way that uses the least energy. 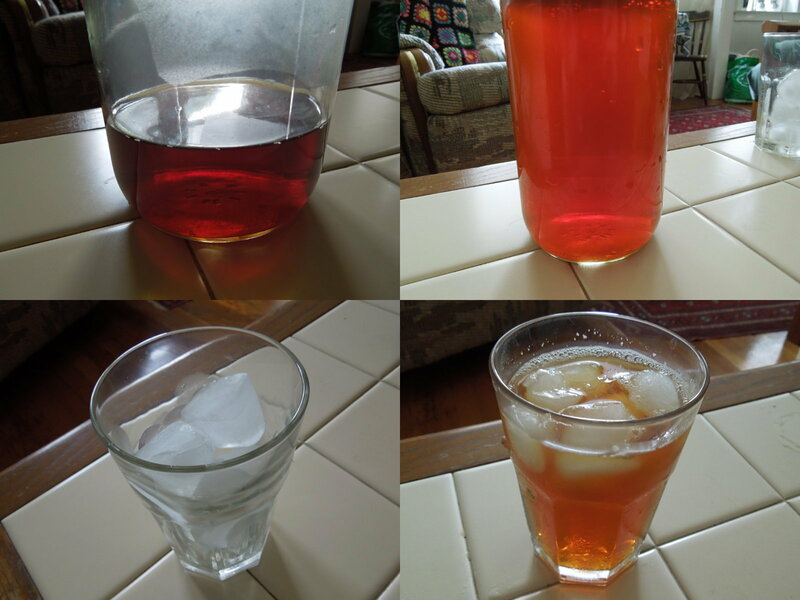 I brew a lot of iced tea: two batches a day of four cups each in the hottest part of the summer, so I’ve had an opportunity to experiment and develop a method that results in superior flavor but is fast, easy, and energy efficient. At the end of the article, you’ll also find an explanation of how drinking iced tea, regardless of how you brew it, can help you further reduce your energy usage! Why is minimizing energy usage important? Energy efficiency is one issue that I care about a lot. Most electricity in the U.S. in generated in ways that have numerous negative impacts on the environment: the burning of coal and natural gas releases both carbon dioxide, a greenhouse gas, and various pollutants into the atmosphere. Coal burning for electricity generation is a major source of mercury, which contaminates seafood like tuna, making it unsafe for consumption. I use EDF’s Seafood Selector and it concerns me how many types of seafood are contaminated with unsafe levels of mercury. Even cleaner forms of energy like hydro, wind, and solar still have some negative impacts on the environment. Although renewable energy production in the U.S. has been increasing, about half [source] of the electricity here still comes from coal-fired plants like this one in Calumet Park. Public Domain Photo by the US EPA, taken from Wikimedia Commons. Global climate change, which is directly related to energy usage, poses a direct threat to numerous countries, through many different mechanisms. Sea level rise threatens low-lying areas as diverse as Florida, New Jersey, and Bangladesh, and the changing climate threatens both ecosystems and agricultural development. Climate change is already negatively impacting the industry that produces tea and herbs. For example, tea production in more arid regions of the world like Kenya is threatened by periods of prolonged drought, and rooibos production in South Africa has also faced threats from climate change. The Ethical Tea Partnership has a page on the negative impacts of climate change on the tea industry. In addition to the long-term benefits of reducing your energy usage, you will see an immediate benefit as well: saving money on your electric bill. I think people with a broad range of views on political and environmental issues can agree that reducing energy usage is a good thing. How does brewing iced tea use energy? How can we reduce these uses? Making your own fresh-brewed iced tea uses energy in two ways: heating and cooling. In order to minimize your energy usage when making up a batch of iced tea, you need to minimize both of these processes. People who have central air or an air-conditioned kitchen will benefit doubly from reducing heating, because any waste heat generated by your heating method will need to be pumped out of your living space by the air conditioner, at additional cost. Brew a very small amount of concentrated tea with hot water. This minimizes the energy used for heating. You can try cold brewing (steeping the tea directly in cold water), but this doesn’t work well with all types of tea. Let the brewed tea cool to room temperature. I do this quickly by placing the tea in a closed jar, and setting it in a pot which I fill with cold water from the tap. This chills the water to the temperature of the cold water in your home, without using any energy for cooling, thus minimizing your cooling costs. Dilute the tea to taste with cold or room temperature water. Chill the tea or, for quick results, pour over ice. For the fastest results, you can skip step 2 and condense steps 3 and 4 by filling a glass, jar, or pitcher with ice and pouring the hot tea on top of the ice, adding any cold water if necessary for additional volume. Below is an illustration of this process. Here I steeped Ahmad Tea’s Ceylon, one of my favorite teas for use as iced tea. Note the dark, concentrated color in the lower-left. Here, I steeped this tea at quadruple strength (four teaspoons of leaf in one cup of water), because I planned to make four cups. The upper right panel shows the tea once it had been diluted to the proper strength. I put this jar in the fridge to chill, but only after I poured myself one cup, pouring over ice (lower left) to produce the cup pictured in the lower right. I used a kimchi jar, which I have found to be quite heat-resistant (and which I always have available, as I eat a lot of kimchi). It’s important to take care with your choice of a glass vessel, as pouring hot liquids into generic glass can sometimes cause it to shatter. There are a few other supplemental tips that you can use to further minimize your energy usage. Microwaves are one of the worst options, being considerably less efficient than a typical electric stove. If you’re not convinced, read this comparison in Home Energy Magazine. Home Energy Magazine, by the way, is a great place for finding more energy-saving tips. If you have a gas stove, unless your electricity comes from a clean, sustainable source, using a gas stove is better than anything with an electric element, because a gas stove converts 100% of stored energy to heat, whereas when using electricity, only a small portion of the stored energy in the fuel used to generate the electricity is converted to electricity–most is released as waste heat at the point of generation, and more is lost through wires in transmission. If you live in a state with electric choice (like Pennsylvania or Texas), choose a sustainable electricity generator like Green Mountain Energy, to minimize the environmental impact of your electricity usage. Choose a cool day or time of day (early morning is typically the coolest time of day) to make large batches of ice or chill large batches of water or iced tea. Refridgerators and freezers need to work harder on hot days. It doesn’t matter if you have central air or if the refridgerator is in a room directly affected by outdoor temperature–any of the heat your fridge pumps out into your home will need to be pumped out again by the air conditioner, which has to work harder when it’s hot outdoors. Follow general best practices for refrigeration. Try to keep your fridge reasonably full; if you don’t have stuff to put in it, you can keep it full of jugs of water and put bags of ice in the freezer. Make sure the coils on the back of your fridge are clean, and that the refrigerator has enough space behind it to allow good air circulation. Check the seal on the door to make sure it is holding the air in. Energy usage is a surprisingly deep topic, in that there is virtually always more you can do to reduce your energy usage. Some energy-saving tips are easier to implement or more practical than others, but I hope that you have at least found some tips above which will help you to prepare iced tea in an environmentally-sound manner that also results in a superior-tasting batch of tea to drink. One of the reasons I have gone so deep into this topic here is that I think the ideas presented here have broad applicability. In the global scheme of things, the amount of energy used in making iced tea is tiny compared to the amount of energy consumed by numerous other things. But the knowledge and ways of thinking that can be used to conserve energy are universal. Processes that generate heat and cooling are at the heart of energy usage in homes, businesses, and industry, and the ideas communicated here are universal and can be applied to far more than just the making of a cup or pitcher of iced tea. There are some parts of the U.S. and parts of the world, where water scarcity is a more pressing issue than energy usage. Where I live, there is little need for water conservation, and the negative impacts of electricity use far outweigh the extra water used. The same is true of costs: typical electricity usage tends to be much more costly in financial terms than typical water usage, at the rates charged by most municipal governments in the U.S. But there are a few places where these rules do not completely hold. In the southwestern U.S., water use has major negative environmental impacts, such as destroying the ecosystem in the Colorado river delta. And in rural areas, people who drink well water often need to use electricity to pump their water, so conserving water is important for conserving electricity. Lake mead, used as a reservoir for cities in the Southwest. This water would have naturally flowed into the Colorado river delta, supporting a rich delta ecosystem, and an estuarine ecosystem in the Gulf of California. Photo by Rick Pecoraro, licensed under CC BY 2.0. The method I described above uses additional water at one step, using a bath of cold water from the tap to cool down the jar of hot tea. If you live in an area where water is scarce, or where you need to use electricity to pump your water, you can skip this step and opt for a slower cool-down to room temperature. There is an additional way that iced tea and other cold beverages, regardless of how you prepare them, can reduce your home energy usage. If you keep your home air conditioned, continually drinking iced tea during the hottest hours can help your body to stay cool, enabling you to feel comfortable in a warmer environment. This can allow you to set your thermostat higher in the hot weather, while still being comfortable. How do you brew iced tea? Do you already use any of these tips here? Did you find any new pointers that you want to try out? Have you had much success with cold-brewing? Do you have any advice for people who wish to attempt cold-brewing? How much do you think about energy saving in general? Have you found some of the ideas and concepts in this post helpful in other aspects of your life, in terms of providing things you can do that can reduce your energy usage? Categories: Semi-republished Posts | Tags: brewing tea, conservation, energy, energy efficiency, environment, iced tea, kitchen, sustainability, tea | Permalink.